When I testified last year before the House Judiciary Committee’s Subcommittee on the Constitution, Civil Rights, and Civil Liberties about Bush interrogation policies, Congressman Trent Franks (R-Ariz) stated that former CIA Director Michael Hayden had confirmed that the Bush administration only waterboarded Khalid Sheikh Mohammed, Abu Zabaydah, and Abd al-Rahim al-Nashirit for one minute each. I told Franks that I didn’t believe that. Sure enough, one of the newly released torture memos reveals that Mohammed was waterboarded 183 times and Zubaydah was waterboarded 83 times. One of Stephen Bradbury’s 2005 memos asserted that “enhanced techniques” on Zubaydah yielded the identification of Mohammed and an alleged radioactive bomb plot by Jose Padilla. But FBI supervisory special agent Ali Soufan, who interrogated Zubaydah from March to June 2002, wrote in the New York Times that Zubaydah produced that information under traditional interrogation methods, before the harsh techniques were ever used. George Washington's Blog: "Torture, Iraq, and 9/11"
Has anyone else noticed that the media, and Congress is acting as though torture is the only crime committed by the Bush White House (with the possible exception of illegal wiretapping)? 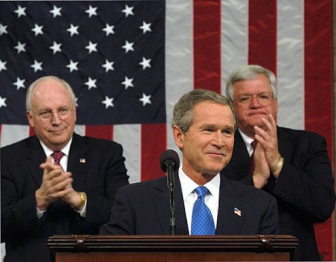 Why has everyone forgotten the other crimes perpetrated by the Bush White House? Crimes like stealing the 2000, and 2004 elections. Proveable crimes concerning the 9/11 attacks like obstruction of justice, and criminal negligence. Crimes like lying this country into war. Crimes like violating the Constitution. The list of crimes committed by the Bush Administration just goes on and on. I've put this detail in a series of posts, but it really deserves a full post. 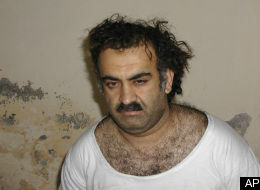 According to the May 30, 2005 Bradbury memo, Khalid Sheikh Mohammed was waterboarded 183 times in March 2003 and Abu Zubaydah was waterboarded 83 times in August 2002. The CIA used the waterboard "at least 83 times during August 2002" in the interrogation of Zubaydah. IG Report at 90, and 183 times during March 2003 in the interrogation of KSM, see id. at 91. URBANA, Ill.--Students and activists won a victory April 9 when they forced the Central Intelligence Agency (CIA) into a last-minute cancellation of its recruitment session at the University of Illinois at Urbana-Champaign. For a third year, members of the Campus Antiwar Network (CAN), Iraq Veterans Against the War and the International Socialist Organization joined forces to protest the CIA, but this is the first year that the agency canceled, after activists exposed the agency's dark history of assassinations, political sabotage and torture. Outside the recruitment session door, one activist donned a black Grim Reaper cloak and stood with arms extended on a milk crate to greet potential recruits and remind them of the atrocities conducted at Abu Ghraib with CIA complicity. Another used a simple pillowcase as a hood and kneeled with arms clasped behind his back to show how prisoners are commonly treated at Bagram Air Base and Guantánamo Bay. If President Bush and Vice-President Cheney think that time is on their side with respect to crimes committed by their administration, this week’s criminal conviction of former Peruvian President Alberto Fujimori should put those thoughts to rest. Returning to Peru in the hope of returning to power, Fujimori was instead put on trial and convicted of “crimes against humanity,” including the killing of 25 people by military death squad. Meanwhile, a Spanish judge, Baltasar Garzon, has opened a criminal investigation of six former Bush officials — Alberto Gonzalez, Douglas Feith, David Addington, John Yoo, Jay Bybee, and William Haynes — for torture allegations arising out of the Pentagon’s operations at Guantanamo. Garzon was the judge who secured a criminal indictment of former Chilean President Augusto Pinochet, which led to Spain’s extradition request for Pinochet when he visited London. While the request was ultimately unsuccessful, Pinochet was detained in London for a year awaiting the final disposition of the request. The five detainees at Guantánamo Bay charged with planning the Sept. 11, 2001, terrorist attacks have filed a document with the military commission at the United States naval base there expressing pride at their accomplishment and accepting full responsibility for the killing of nearly 3,000 people. The document, which may be released publicly on Tuesday, uses the Arabic term for a consultative assembly in describing the five men as the “9/11 Shura Council,” and it says their actions were an offering to God, according to excerpts of the document that were read to a reporter by a government official who was not authorized to discuss it publicly. The document is titled “The Islamic Response to the Government’s Nine Accusations,” the military judge at the Guantánamo Bay detention camp said in a separate filing, obtained by The New York Times, that describes the detainees’ document. The document was filed on behalf of the five men, including Khalid Shaikh Mohammed, who has described himself as the mastermind of the Sept. 11 attacks.